Coxreels EZ-S “Safety Series Side Mount” spring driven hose reels are compact, versatile and unique in the way they mount and operate. They feature a simple two-bolt mounting pattern for easy installation and detachment for multiple workstation applications. The 360˚ hose direction allows the user to operate the reel from front to back, top to bottom, any direction the job demands. The EZ-S series also features Coxreels’ patented EZ-Coil™ rewind safety system that retracts up to 80% slower than conventional reels for greater operator safety and protection of property. Common applications include air/water service units, tool benches, tool boxes, vertical walls and beams, vehicle lift systems, machine tools, service vehicles, any flat vertical surface that requires the convenience, safety and efficiency of a hose reel. Available in Left Hand and Right Hand mounting positions. All Coxreels are built to order, please allow 2-3 weeks for delivery. 2-Bolt Mounting Pattern Easily Mounts & Detaches For Multiple Work Station Applications Heavy Gauge Steel Arm Mounts Flat To Any Surface Such AsTool Boxes, Benches, Vehicle Lifts, Beams, etc. 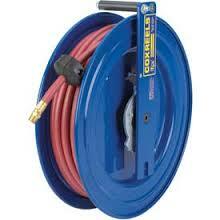 360˚ Payout Designed For Use From Any Direction Hose Control Bar Is Full Drum Width Preventing D..